Our open storage partner, Nexenta Systems Inc., hit a milestone this month by releasing NexentaStor 4.0.1 for general availability. This release is significant mainly because it is the first commercial release of NexentaStor based on the Open Source Illumos kernel and not Oracle’s OpenSolaris (now closed source). With this move, NexentaStor’s adhering to the company’s promise of “open source technology” that enables hardware independence and targeted flexibility. See Nexenta’s 4.0.1 Release Notes for additional changes and details. 2.2 If You have acquired a Community Edition license, the total amount of Storage Space is limited as specified on the Site and is subject to change without notice. The Community Edition may ONLY be used for educational, academic and other non-commercial purposes expressly excluding any commercial usage. The Trial Edition licenses may ONLY be used for the sole purposes of evaluating the suitability of the Product for licensing of the Enterprise Edition for a fee. If You have obtained the Product under discounted educational pricing, You are only permitted to use the Product for educational and academic purposes only and such license expressly excludes any commercial purposes. For those who operate under the Community license, this means your total physical storage is UNLIMITED, provided your space “IN USE” falls short of 18TB (18,432 GB) at all times. Where this is important is in constructing useful arrays with “currently available” disks (SATA, SAS, etc.) Let’s say you needed 16TB of AVAILABLE space using “modern” 3TB disks. The fact that your spinning disks are individually larger than 600GB indicates that array rebuild times might run afoul of failure PRIOR to the completion of the rebuild (encountering data loss) and mirror or raidz2/raidz3 would be your best bet for array configuration. 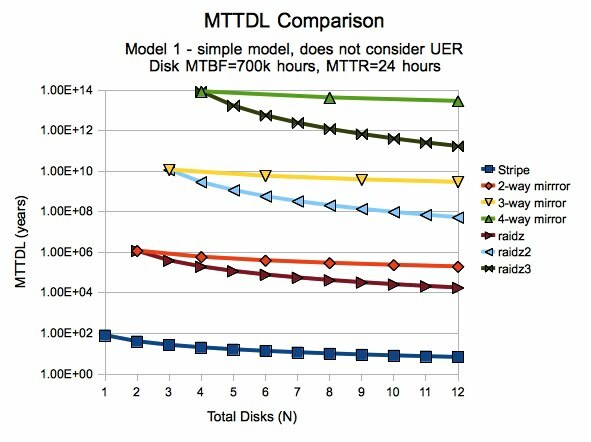 SOLORI Note: Richard Elling made this concept exceedingly clear back in 2010, and his “ZFS data protection comparison” of 2, 3 and 4-way mirrors to raidz, raidz2 and raidz3 is still a great reference on the topic. By “raw” licensing standards, the 3-way mirror would require a 76TB license while the raidz2 volume would require a 51TB license – a difference of 25TB in licensing (around $5,300 retail). However, under the Community License, the “cost” is exactly the same, allowing for a considerable amount of flexibility in array loadout and configuration. Why do I need 54TiB in disk to make 16TB of “AVAILABLE” storage in Raidz2? SOLORI’s Take: If you’re running 3.x in production, 4.0.1 is not suitable for in-place upgrades (yet) so testing and waiting for the “non-disruptive” maintenance release is your best option. For new installations – especially inside a VM or hypervisor environment as a Virtual Storage Appliance (VSA) – version 4.0.1 presents a better option over it’s 3.x siblings. If you’re familiar with 3.x, there’s not much new on the NMV side outside better tunables and snappier response. The latest update of NexentaStor may not go too smoothly if you are using Windows Server 2008 AD servers and delegating shares via NexentaStor. While the latest update includes a long sought after fix in AD capabilities (see pull quote below) it may require a tweak to the CIFS Server settings to get things back on track. It is now possible to allow Domain groups as members of local groups. When a Windows client authenticates with NexentaStor using a domain account, NexentaStor consults the domain controller for information about that user’s membership in domain groups. NexentaStor also computes group memberships based on its _local_ groups database, adding both local and domain groups based on local group memberships, which are allowed to be indirect. NexentaStor’s computation of group memberships previously did not correctly handle domain groups as members of local groups. A recent patch release by Microsoft has necessitated a changed to the CIFS authorization setting. Without changing this setting, customers will see CIFS disconnects or the appliance being unable to join the Active Directory domain. If you experience CIFS disconnects or problems joining your Active Directory domain, please modify the ‘lmauth_level’ setting. While this may work for others out there it does not universally work for any of my tested Windows Server 2008 R2, native AD mode servers. Worse, it appears to work with some shares, but not all; this can lead to some confusion about the actual cause (or resolution) of the problem based on the Nexenta release notes. Fortunately (or not, depending on your perspective), the genesis of NexentaStor is clearlyheading toward an intersection with Illumos although the current kernel is still based on Open Solaris (134f), and a post from OpenIndiana points users to the right solution. adjusted down lmauth_level should put it back the the default. domain mode. The default value is 3. The following describes the behavior at each level. the Solaris CIFS server sends NTLM requests. the Solaris CIFS server sends LMv2 and NTLMv2 requests. Solaris CIFS server sends LMv2 and NTLMv2 requests. CIFS server sends LMv2 and NTLMv2 requests. SOLORI’s Take: So while NexentaStor defaults back to ‘lmauth_level=4’ and ‘lmauth_level=2’ is now broken (for my environment), the “default” for OpenIndiana and Solaris (‘lmauth_level=3’) is a winner; as to why – that’s a follow-up question… Meanwhile, proceed with caution when upgrading to NexentaStor 3.1.3 if your appliance is integrated into AD – testing with the latest virtual appliance for the win. In my last post, I mentioned a much complained about “idle” CPU utilization quirk with NexentaStor when running as a virtual machine. After reading many supposed remedies on forum postings (some reference in the last blog, none worked) I went pit-bull on the problem… and got lucky. As an avid (er, frequent) NexentaStor user, the luster of the NMV (Nexenta’s Web GUI) has worn off. Nearly 100% of my day-to-day operations are on the command line and/or Nexenta’s CLI (dubbed NMC). This process includes power-off events (from NMC, issue “setup appliance power-off” or “setup appliance reboot”). For me, the problem cropped-up while running storage benchmarks on some virtual storage appliances for a client. These VSA’s are bound to a dedicated LSI 9211-8i SAS/6G controller using VMware’s PCI pass-through (Host Configuration, Hardware, Advanced Settings). The VSA uses the LSI controller to access SAS/6G disks and SSDs in a connected JBOD – this approach allows for many permutations on storage HA and avoids physical RDMs and VMDKs. Using a JBOD allows for attachments to PCIe-equipped blades, dense rack servers, etc. and has little impact on VM CPU utilization (in theory). So I was very surprised to find idle CPU utilization (according to ESXi’s performance charting) hovering around 50% from a fresh installation. This runs contrary to my experience with NexentaStor, but I’ve seen reports of such issues on the forums and even on my own blog. I’ve never been able to reproduce more than a 15-20% per vCPU bias between what’s reported in the VM and what ESXi/vCenter sees. I’ve always attributed this difference to vSMP and virtual hardware (disk activity) which is not seen by the OS but is handled by the VMM. During the testing phase, I’m primarily looking at the disk throughput, but I notice a persistent CPU utilization of 50% – even when idle. Regardless, the 4 vCPU VSA appears to perform well (about 725MB/sec 2-process throughput on initial write) despite the CPU deficit (3 vCPU test pictured above, about 600MB/sec write). However, after writing my last blog entry, the 50% CPU leach just kept bothering me. 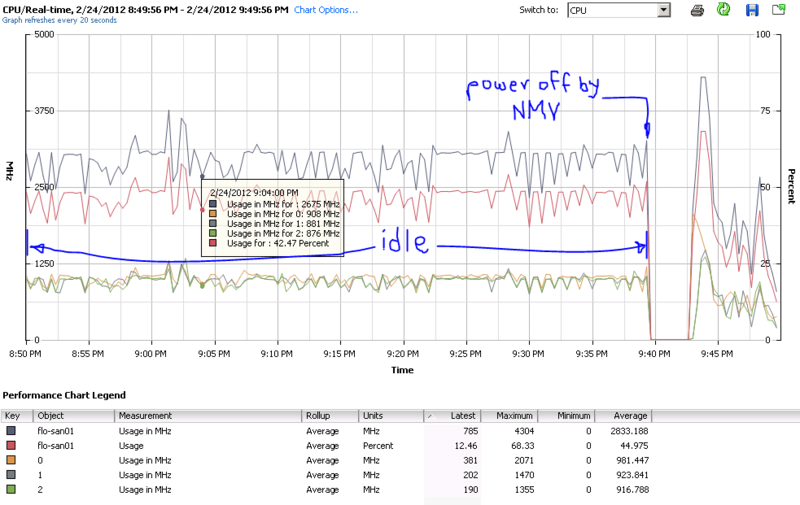 After wasting several hours researching and tweaking with very little (positive) effect, a client e-mail prompted a NMV walk through with resulted in an unexpected consequence: the act of powering-off the VSA from web GUI (NMV) resulted is significantly reduced idle CPU utilization. 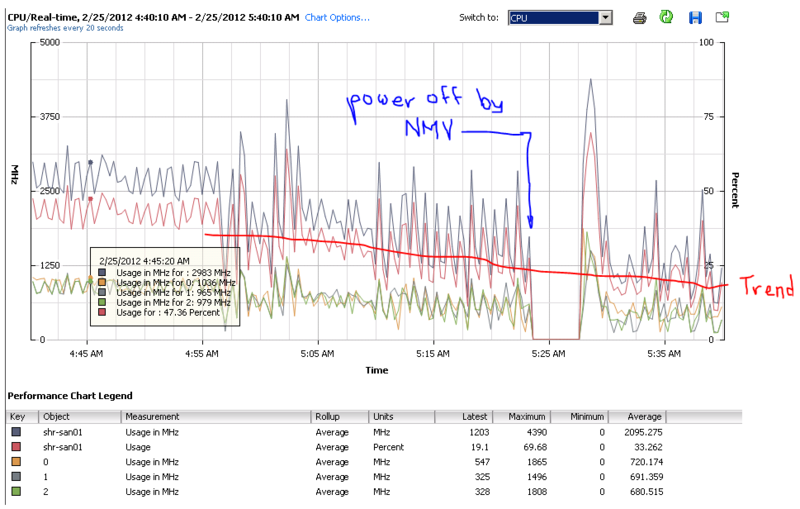 Getting lucky: noticing a trend after using NMV to reboot for a client walk-through of the GUI. Working with the 3 vCPU VSA over the previous several hours, I had consistently used the NMC (CLI) to reboot and power-off the VM. The fact of simply using the NMV to shutdown the VSA couldn’t have anything to do with idle CPU consumption, could it? Remembering that these were fresh installations I wondered if this was specific to a fresh installation or could it show up in an upgrade. According to the forums, this only hampered VMs, not hardware. Regression into my legacy VSA library, upgrading from 3.1.1 to 3.1.2 to check if the problem follows the NexentaStor version. If anything, the upgraded VSA exhibited slightly less idle CPU utilization than its previous version. 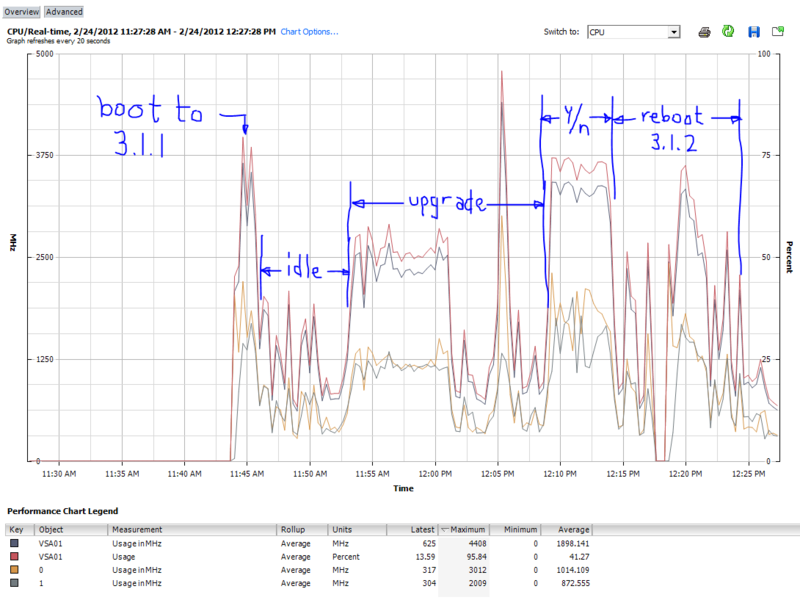 Noteworthy, however, was the extremely high CPU utilization as the VSA sat waiting for a yes/no response (NMC/CLI) to the “would you like to reboot now” question at the end of the upgrade process (see chart above). Once “no” was selected, CPU dropped immediately to normal levels. While working on an article on complex VSA’s (i.e. a virtual storage appliance with PCIe pass-through SAS controllers) an old issue came back up again: NexentaStor virtual machines still have a problem installing VMware Tools since it branched from Open Solaris and began using Illumos. While this isn’t totally Nexenta’s fault – there is no “Nexenta” OS type in VMware to choose from – it would be nice if a dummy package was present to allow a smooth installation of VMware Tools; this is even the case with the latest NexentaStor release: 3.1.2. 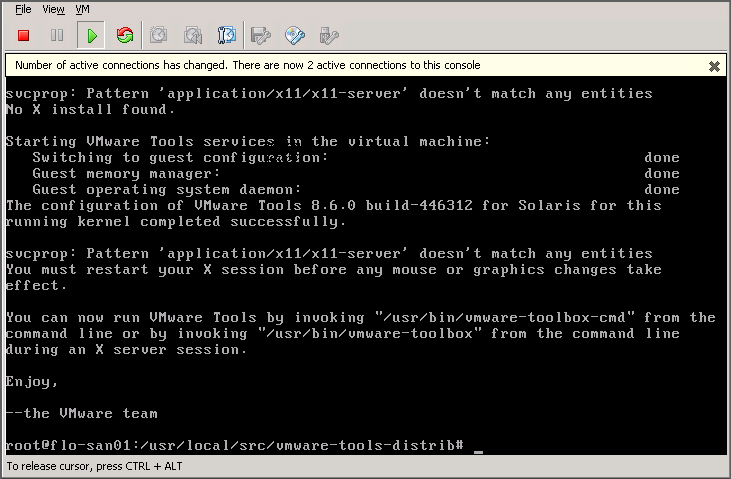 I could not find where I had documented the fix in SOLORI’s blog, so here it is… Note, the NexentaStor VM is configured as an Oracle Solaris 11 (64-bit) virtual machine for the purpose of vCenter/ESXi. This establishes the VM’s relationship to a specific VMware Tools load. Installation of VMware Tools in NexentaStor is covered in detail in an earlier blog entry. VMware Tools bombs-out at SUNWuiu8 package failure. Illumos-based NexentaStor has no such package. Instead, we need to modify the vmware-config-tools.pl script directly to compensate for the loss of the SUNWuiu8 package that is explicitly required in the installation script. 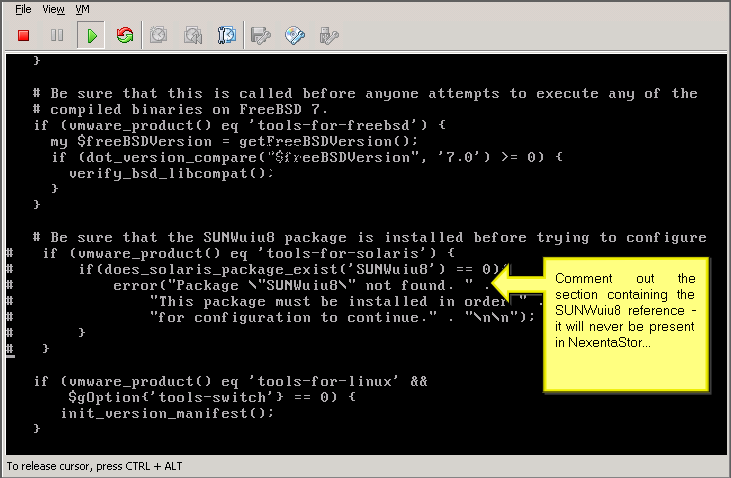 Commenting out the SUNWuiu8 related section allows the tools to install with no harm to the system or functionality. 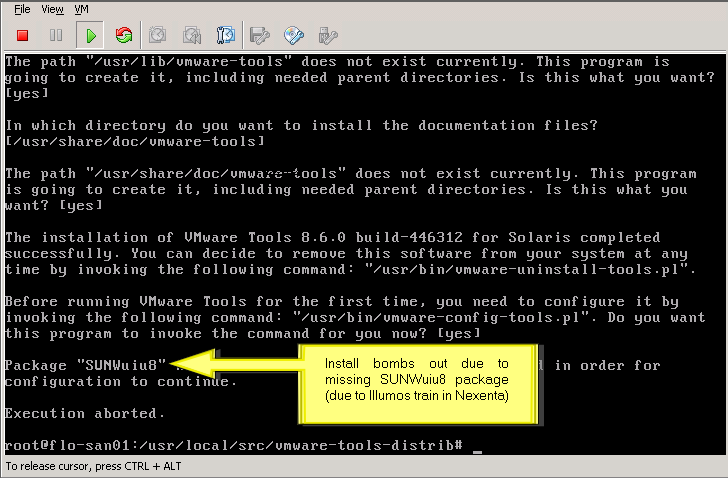 Note the full “if” stanza for where the VMware Tools installer checks for ‘tools-for-solaris’ must be commented out. Since the SUNWuiu8 package does not exist – and more importantly is not needed for Illumos/Nexenta – removing a reference to it is a good thing. Now the installation can proceed as normal. After the changes, installation completes as normal. SOLORI’s Note: There is currently a long-standing bug that affects NexentaStor 3.1.x running as a virtual machine. Currently there is no known workaround to keep NexentaStor from running up a 50% cpu utilization from ESXi’s perspective. Inside the NexentaStor VM we see very little CPU utilization, but from the performance tab, we see 50% utilization on every configured vCPU allocated to the VM. Nexenta is reportedly looking into the cause of the problem. I looked through this and there is nothing that stands out other that a huge number of interrupts while idle. I am not sure where those interrupts are coming from. I see something occasionally called volume-check and nmdtrace which could be causing the interrupts. A bug report was reportedly filed a couple of days ago to investigate the issue further. Nexneta Systems Inc released version 3.1 of its open storage software yesterday with a couple of VMware vSphere-specific feature enhancements. These enhancements are specifically targets at VMware’s vStorage API for Array Integration (VAAI) which promises to accelerate certain “costly” storage operations by pushing their implementation to the storage array instead of the ESX host. Example. Accelerates zero block writes when creating new virtual disks. SCSI ATS (Atomic Test & Set): Supported in vSphere 4.1 and later. Example. Enables specific LUN “region” to be locked instead of entire LUN when cloning a VM. SCSI Block Copy: Supported in vSphere 4.1 and later. Example. Avoids reading and writing of block data “through” the ESX host during a block copy operation by allowing VMware to instruct the SAN to do so. SCSI Unmap: Supported in vSphere 5 and later. Enables freed blocks to be returned to the zpool for new allocation when no longer used for VM storage. Given the addition of VAAI features, the upgrade offers some compelling reasons to make the move to NexentaStor 3.1 and at the same time removes obstacles from choosing NexentaStor as a VMware iSCSI platform for SMB/SME (versus low-end EMC VNXE, which at last look was still waiting on VAAI support.) However, for existing vSphere 4.1+ environments, a word of caution: you will want to “test, test, test” before upgrading to (or enabling) VAAI (fortunately, there’s a NexentaStor VSA available). In the past, NexentaStor’s auto-sync plug-in has been the only integrated means of block replication from one storage pool (or array) to another. In the past, the plug-in allowed for periodic replication events to be scheduled which drew from a marker snapshot until the replication was complete. Upon extended error (where the replication fails), the failure of the replication causes a roll-back to the marker point, eliminating any data that has transferred between the pools. For WAN replication, this can be costly as no check-points are created along the way. More problematically, there has been no way to recreate a replication service in the event it has been either deleted or missing (i.e. zpool moved to a new host.) This creates a requirement for the replication to start over from scratch – a problem for very large datasets. With Auto-Sync 3.1, later problem is resolved, and provided NexentaStor can find at least one pair of identical snapshots for the file system. Where I find this new “feature” particularly helpful is in seed replications to external storage devices (i.e. USB2.0 arrays, JBODs, etc.). This allows for a replication to external, removable storage to (1) be completed locally, (2) shipped to a central repository, and (3) a remote replication service created to continue the replication updates over the WAN. Additionally, consider the case where the above local-to-WAN replication seeding takes place over the course of several months and the hardware at the central repository fails, requiring the replication pool to be moved to another NexentaStor instance. In the past, the limitation on auto-sync would have required a brand new replication set, regardless of the consistency of the replicated data on the relocated pool. Now, a new (replacement) service can be created pointing to the new destination, and auto-sync promises to find the data – intact – and resume the replication updates starting with the last identical marker snapshot. The default transport for replication in NexentaStor 3.1 is now NexentaStor’s TCP-based Remote Replication protocol (RR). While SSH is still an option for non-NexentaStor destinations, netcat is no longer supported for auto-sync replications. While no indication of performance benefits are available, two tunable parameters are available for RR auto-sync services (per service): TCP connection count (-n) and TCP package size (-P). Defaults for each of these are 4 and 1024, respectively, meaning 4 connections and 1024KB PDU size for the replication session. For VMware vSphere deployments in SMB, SME and ROBO environments, NexentaStor 3.1 looks to be a good fit, offering high-performance CIFS, NFS, iSCSI and Fiber Channel options in a unified storage environment complete with VAAI support to accelerate vStorage applications. For VMware View installations using NexentaStor, the VAAI/ATS feature should resolve some iSCSI locking behavior issues that have made NFS more attractive but remove SCSI-based VAAI features. That said, with the storage provisioning changes in View 4.5 and upcoming View 5, the ability to pick from FC, iSCSI or NFS (especially at 10G) from within the same storage platform has definite advantages (if not complexity implications.) Suffice to say, NexentaStor’s update is adding more open storage tools to the VMware virtualization architect’s bag of tricks. NexentaStor 3.1 is available for download now. Nexenta places the highest importance on maintaining access to and integrity of customer data. The purpose of this Technical Bulletin is to make you aware of an issue with the process of upgrading to 3.1. Nexenta has discovered an issue with the software delivery mechanism we use. This issue can result in errors during the upgrade process and some functionality not being installed properly. Please postpone upgrading to v3.1 until our next Technical Bulletin update. We are actively working to get this corrected and get it back to 100 % service as fast as possible. Until the issue is resolved we have removed 3.1 from the website and suspended upgrades. Thanks for your patience. Today, while working on a follow-up post, the lab systems (virtual storage appliances) were updated to NexentaStor 3.1.1 (both Enterprise and Community editions). 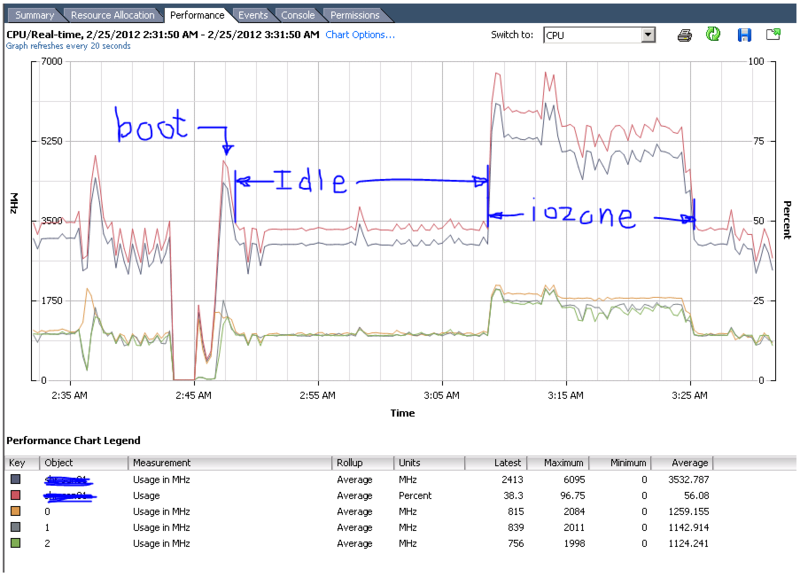 Since a question was raised about the applicability of the VAAI enhancements to Community Edition (NexentaStor CE), I’ve got a teaser for you: see the following image of two identical LUNs mounted to an ESXi host from NexentaStor Enterprise Edition (NSEE) and NexentaStor Community Edition (NSCE). If you look closely, you’ll notice they BOTH show “supported” status. vSphere VMFS5 Datastores provided by NexentaStor Community (VSA04) and Enterprise (VSA03) editions. Nexenta officially re-released NexentaStor 3.1 today in the form of version 3.1.1 – it is available for download now. Following-up on the last installment of managing CIFS shares, there has been a considerable number of questions as to how to establish domain user rights on the share. From these questions it is apparent that the my explanation about root-level share permissions could have been more clear. To that end, I want to look at default shares from a Windows SBS Server 2008 R2 environment and translate those settings to a working NexentaStor CIFS share deployment. 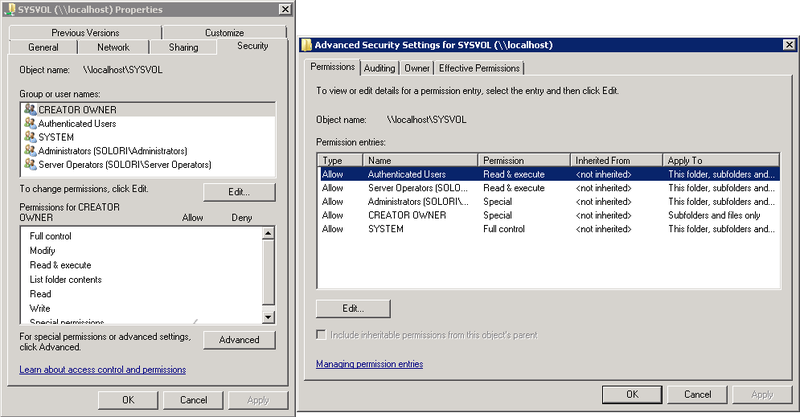 The key to observe here is the use of Windows built-in users and NT Authority accounts. Also, it is noteworthy that some administrative privileges are different depending on inheritance. For instance, the Administrator’s rights are less than “Full” permissions on the share, however they are “Full” when inherited to sub-dirs and files, whereas SYSTEM’s permissions are “Full” in both contexts. Note that Administrators privileges are truncated (not “Full”) with respect to the inherited rights on sub-dirs and files when compared to the NETLOGON share ACL. You are currently browsing the archives for the Open Source Storage category.